Harvest time is the best time. This Zucchini, Carrot and Citrus Cake is so moist and delicious I bet you will be keeping all those zucchini for yourself now! Chef Hack * Soak currents in warm water to cover and dollop of vanilla or good Brandy (about 30 minutes) to rehydrate and plump before using. 1-Preheat the oven to 350’F. 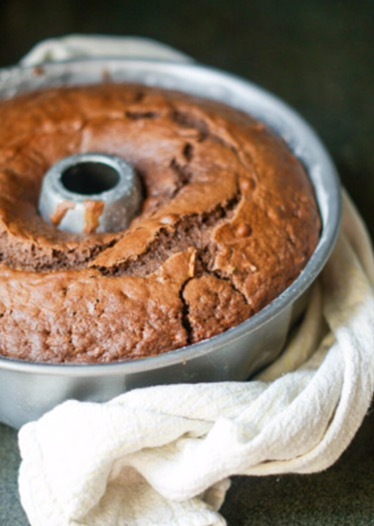 Spray a 12 cup Bundt pan generously with nonstick cooking spray, or a 9 x 13 in glass baking pan. 2-In a large bowl, combine the dry ingredients. Mix with a whisk to thoroughly combine. 3-In a separate large mixing bowl thoroughly blend together all wet ingredients. 4- Mix the dry ingredients into wet ( in this order) in batches, thoroughly mixing in between each addition until completely combined. Folden nuts and or currents and poppyseeds. 5- Pour batter into pan. Bake for 40-55 minutes or until wooden toothpick inserted in the center comes out clean. 6- Transfer to wire rack for 10-15 minutes, then invert cake onto rack and allow to cool completely. Frost with Lemon Cream Cheese frosting. Slather this sweet but slightly tangy frosting on your cooled cake for a luscious combonation of flavor. In a medium bowl, beat the cream cheese, powdered sugar and nut milk together. Spread over the top of the cake while on rack sitting on a cookie sheet, lined with parchment paper (to catch excess). Sprinkle with poppyseeds and or additional lemon zest. Yay, Slow Cooking Season has Arrived! Try my Families Favorite, Slow Sunday Chicken Chile Verde!